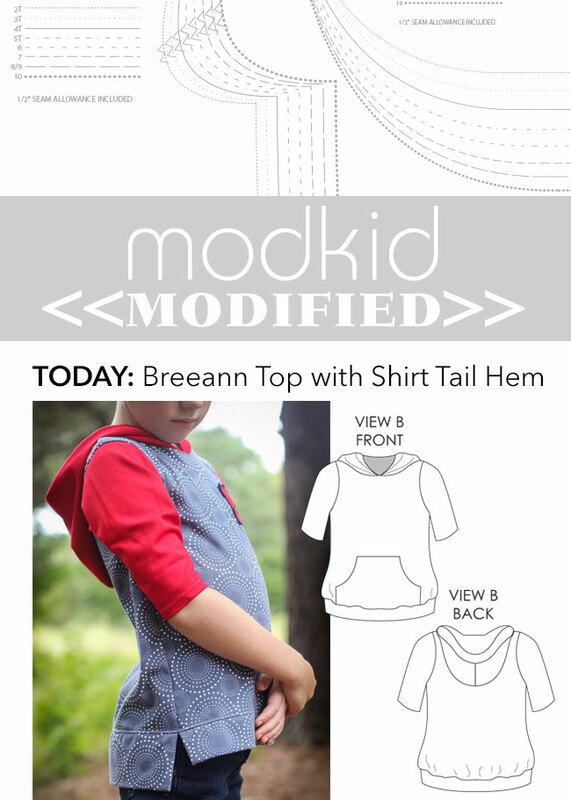 The Modkid Breeann is one of a few patterns designed specifically for tween sizing ranging from 8/9 to 16. It is such a great piece on its own or layered. This is the first of two posts I've put together for a little modified version. Today, I'll show you how I swapped the banded hem for a shirttail hem. Cut all of your pattern pieces as indicated in the pattern except the waistband and pocket. Sew up the Breeann top per the pattern instructions omitting the pocket. Stop when you get to the waistband instructions. Measure the front and back of the bottom of your top from side seam to side seam. This was 15" for mine. Add 1" to the width you measured for the length of your shirttail bands. Determine the finished height you would like for the bands and double it. For an asymmetrical look, I've used a height of 4" for the front and 6" for the back. So, the bands I cut were 4" x 16" and 6" x 16". Fold the bands in half lengthwise with right sides together. Stitch along each short end with a 1/2" seam allowance. Trim the corners at the fold. Turn the bands right side out and press well. Pin the bands right sides together, raw edges aligned to the shirt front and back. Align the shirttail ends with the side seams. Stitch to the bottom of the shirt with a 1/2" seam allowance. Fold the shirttail down and press the seam allowance toward the shirt front and back. Topstitch close to the seam on the shirt side. That's it for a simple switch to add variety to your Modkid Breeann!